RICHLAND, Wash. — As the Arctic warms, tons of carbon locked away in Arctic tundra will be transformed into the powerful greenhouse gases carbon dioxide and methane, but scientists know little about how that transition takes place. Now, scientists looking at microbes in different types of Arctic soil have a new picture of life in permafrost that reveals entirely new species and hints that subzero microbes might be active. Such information is key to prepare for the release of gigatons of methane, which could set the Earth on a path to irreversible global warming. Appearing in today's issue of Nature, the study will help researchers better understand when and how frozen carbon might get converted into methane. The results suggest how microbes survive in the subzero temperatures of permafrost. "The microbes in permafrost are part of Earth's dark matter. We know so little about them because the majority have never been cultivated and their properties are unknown," said microbiologist Janet Jansson of the Department of Energy's Pacific Northwest National Laboratory. "This work hints at the life strategies they use when they've been frozen for thousands of years." Permafrost, the layer of Arctic ground that is always frozen, lies underneath a layer that thaws and refreezes every year, which scientists call the "active layer". Permafrost locks carbon away in vegetative matter. Microbes in the bog generate methane from this carbon, but researchers aren't sure how the soil microbes go from frozen to marshy methane producers. "Estimates are that permafrost stores between 780 and 1,400 gigatons of terrestrial carbon. That's a huge reservoir," said Jansson. "What happens when permafrost thaws and trapped carbon is available for microbes?" Previous experiments by Jansson and collaborators have shown that thawing frozen soil in the lab quickly leads to a burst of methane production, along with a change in the community of microbes. For this study, Jansson and colleagues wanted to examine how natural thawing affected microbes in tundra transitioning from permafrost to bog in the Arctic. To get an overall picture of how the communities transform from frozen snoozers to bustling bacteria, they used a combination of molecular tools collectively known as "omics". These tools revealed the particular genes the microbes are equipped with, which genes they turn on, and the proteins they wield that allow them to survive on the resources around them. To do this, Jansson and colleagues explored permafrost, active layer, and bog soil samples collected by researchers with the United States Geological Survey. 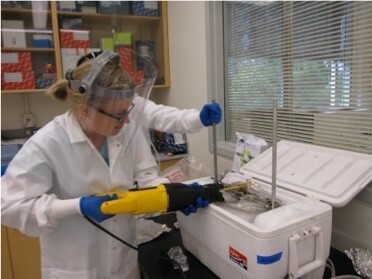 They identified microbial genes and their activity with help from DOE's Joint Genome Institute in Walnut Creek CA. And they collaborated with scientists from several universities, national laboratories and biotechnology companies to identify proteins in the various soils. Beginning this research at DOE's Lawrence Berkeley National Laboratory, Jansson completed the analyses at DOE's Pacific Northwest National Laboratory. Gene information told the researchers which microbe species were present in each layer, how closely they were related to each other and what they could potentially be doing. They found an undiscovered diversity of microbes in Arctic soils and were able to describe several completely novel microbes in each type of soil. Gene activity and the presence of proteins, which are a microbe's tools for living, indicated what the microbes were doing. For example, even though the permafrost microbes lived at subzero temperatures and had a lot of proteins for protection against freezing conditions, they also wielded proteins that indicated they could move through the soil, use iron for energy or live on methane. Soil microbes in the active layer had other protein tools that would let them find nutrients in an environment that goes through cycles of freezing and thawing. As expected, the bog microbes showed gene activity and protein tools for producing methane, and the team identified many species whose main job is to make methane, called methanogens. However, the team was surprised to find several brand new species of them. Methanogens, old and new, took over the communities that lived in the bog. "This work provides the first demonstration of this combination of omics tools to gain a more mechanistic understanding of life in permafrost and the changes that occur during natural thaw," said Jansson. "We know changes happen as permafrost turns into bog, but we don't yet know the significance of these changes at a molecular level." This work was primarily supported by the Department of Energy's Office of Science, the United States Geological Survey and the Academy of Finland. Reference: Jenni Hultman, Mark P. Waldrop, Rachel Mackelprang, Maude M. David, Jack McFarland, Steven J. Blazewicz, Jennifer Harden, Merritt R. Turetsky, A. David McGuire, Manesh B. Shah, Nathan C. VerBerkmoes, Lang Ho Lee, Kostas Mavrommatis, Janet K. Jansson. Multi-omics of permafrost, active layer and thermokarst bog soil microbiomes, Nature, March 4, 2015, DOI:10.1038/nature14238.